“Asiae Nova Delineatio“, Copper engraving published by Nicolaes Visscher in 1680. Original hand colouring. Size: 44,1 x 54,8 cm. 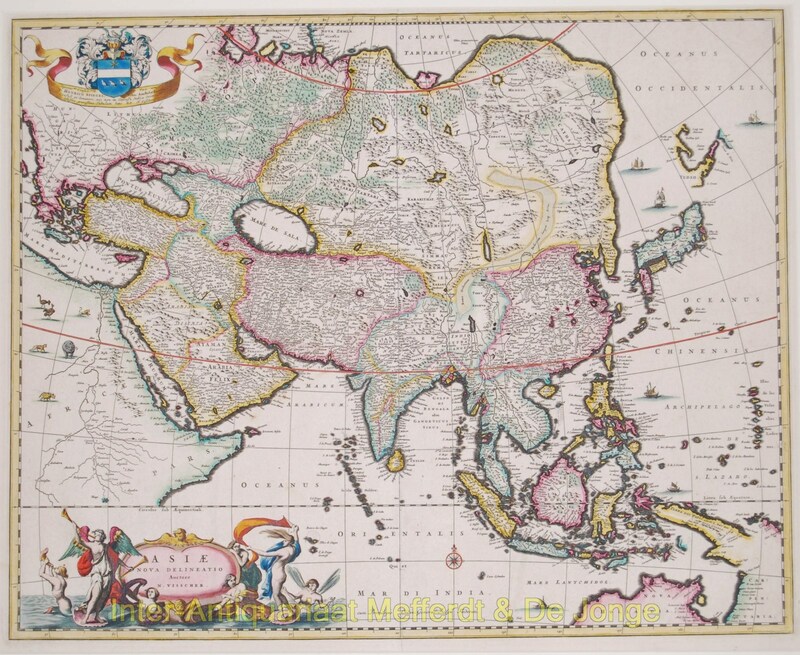 Beautiful map of the whole of Asia and the East Indies. The discoveries of Abel Tasman, Janszoon and Cartensz are reflected in Australia and New Guinea. The delineation of Japan follows that of Mercator-Hondius but also includes the discoveries of Maarten Gerritsz. de Vries in Yedso (Hokkaido). A long stretch of desert identified as the Xamo (Mandarin for ‘sandy desert’) and Lop, snakes its way through the western part of China. The map is ornamented with various types of sailing vessels, animals, a compass rose, a dedication and coat of arms of D. Henrico Spiegel, Senator of Amsterdam, animals on the African continent, and a splendid title cartouche.